Shifting gears on my 2007 Moto Guzzi California Vintage had not been going very well for me at around 17000 miles on the odometer. It has been a while since I wrote my long term review, and also a long while since I had any problem with my bike. Here I explain the problem I found and how I resolved it. I’ve been missing shifts and have somehow stopped a few times in second gear when I thought I was in first. I also have noticed when I tried to downshift, it did not seem to want to shift right away. The only clue, besides me getting older, is that my heel-toe shift linkage seems to have more play in it than I remember it having, but this was not an overnight change. I briefly inspected the heel-toe shift lever linkage a few times. I looked at the adjustable linkage rods and found all the original paint marks still lined up at the adjustment nuts. Surprisingly, there was no sign that anything had become loose. A long time ago, a nut at the main pivot for the shifter had loosened and caused a similar symptom, but I checked that first, and that nut is still tight from when I addressed that issue a few years ago. Seemed as if all looked ok, but upon closer inspection, I finally saw the problem! It was a little difficult to see in there, but I followed the foot shifter linkage to where it connects to the the actual transmission shaft. Seems obvious to do that, but it is a somewhat hidden behind the frame down near where the 12 VDC power outlet is on the left side of this bike. Once I found it, I saw the transmission has a short splined shaft actually pointing towards the rear tire. On that shaft, there is a stubby cast or forged (I think forged) steel arm that the linkage is connected to. 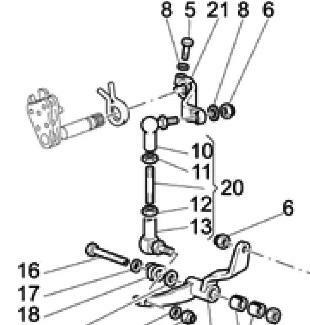 This arm is item 21 on the parts diagram. The arm has a female splined inside diameter and has a M6 screw to clamp it onto the male splined shaft of the transmission. That screw is item 5 on the diagram. When you move the foot shifter, it causes that short arm to rotate the shaft clockwise or counterclockwise just a small amount to change the gear selection. On a simple or more conventional motorcycle, this splined shaft would usually point directly out the left side of the transmission and would have a foot shift lever directly fastened to in this same way, but often without any additional linkage. On my Moto Guzzi California, this shaft points to the rear, so therefore, it has to have some linkage mechanism to reach and connect to the foot shifter whether it is heel-toe or not. Finally getting to the cause of my shifting woes, that stubby arm was so loose it was almost falling off the splined shaft. There is a groove on the shaft that the more or less traps the clamping screw so that the arm won’t be able to fall off, but it was mighty close to doing so. While the parts diagram shows a washer (item 8) on that screw, it is simply a plain thin washer, not a lock washer. No wonder I had so much play in the heel and toe shifter! The problem was a little tricky for me to see until I got a flashlight and looked directly at that arm (not much room to actually see it in there) while I moved the foot lever up and down. It was wobbly and not able to stay firmly engaged onto the splines for the complete amount of rotation to select the next gear. After seeing that, I wondered how in the world I was able to actually shift at all! I thanked my lucky stars that the arm did not fall off the shaft since I would have been stranded for a while for sure. First task was to disconnect that short steel arm from the rest of the shift linkage. Second task was to remove the short arm from the transmission shift shaft to clean and inspect the splines on that shaft and the inside splines on the arm. Third task was to re-install the arm onto the shaft with proper alignment for the foot shifter travel to be correct again. If you are off a spline in one direction or the other, the foot shifter will be pointing too far up or down. Since all the factory adjustments were still intact, I knew pretty easily what spline position was right when I reinstalled the arm and reconnected the rest of the foot lever linkage to it. I changed the plain washer to a lock washer on the clamp screw for the shift arm to help avoid a repeat of this problem in the future. It would have been great to change the clamp screw to a grade 8 hex head so that I could get on it with an open end wrench. By doing so, I wouldn’t have to remove the seat and battery next time to get a tool on it. I learned a few things in taking on this little maintenance task myself. Aside from learning that I need to keep an eye on that in the future (and so should you if you have a Moto Guzzi California or California Vintage like mine), I learned how to get good access to that shift arm clap screw. Moto Guzzi uses a hex socket head cap screw to clamp that arm to the shaft (also known as an Allen screw). The problem is that it is almost impossible to service that screw without taking things apart to get access to it. If it was a hex head bolt, you could probably get a wrench on it without taking stuff off, but it is not. I tried like crazy to use a few different length hex keys (Allen wrenches) to get onto the screw from between the rear tire and just above the swingarm pivot. I could just get the hex key on it and could turn it just a little at a time. Someone with larger hands and arm might not be able to do that. After spending way too much time trying to do it that way I gave up and decided to take a different approach the next day. I now realized I will absolutely have to get to it from directly above, not from the rear tire or from the sides. On my second attempt, which I am referring to as my top-down approach, I removed the seat first. As you may know if you have a similar era Moto Guzzi California motorcycle, you unlock the seat with your ignition key in the seat lock switch located on the left side of the bike below the triangular side cover. I then removed the black plastic tool tray that rests on the frame directly above the battery. Next, I removed the battery hold-down clamp, disconnected the battery terminals, and lifted out the battery. Under the battery, there is a black rubber tray that it sits on. I pulled out that rubber tray to find a metal plate that has some large holes. Looking down through those holes, I could see the head of the clamp screw that I needed to get to. Holding the short end of the hex key, I could now insert it into the screw head without any problem. Finally. I hope this write up helps my fellow Moto Guzzi owners out there to keep and maintain their bikes. Small things like that loose shift lever screw could really mess up someone’s ride if they didn’t know what to look out for. Because of a flat rear tire on my 2007 Moto Guzzi California Vintage, I decided to remove the rear wheel by myself. I had never tried to do this before, but found it relatively easy to do. Luckily, I discovered the flat tire while at home. I would not want to do this on the side of the road, and I admire anyone that has done so. Thanks John, I just bought a CalVin with a sloppy gearchange which I might otherwise have categorised as character had I not read your post. My Allen bolt had been abused so I was unable to tighten it through the existing holes. After battling with it for what seemed an age, I gave up and simply drilled another hole directly above the bolt and was then able to sort the problem, much better now. Hii Everyone, on a slightly similar note. I had a problem with the long gear shift link rod that bent (part 9) on the diagram. I checked to see if I also had the same problem with the small lock bolt but find I was just toooo heavy on the gears. That bolt was good and tight. In trying to fix the link rod I found the stock part was not available in any really normal time frame so ended up having a stainless steel rod made up at 8mm diameter and threaded to take two RS ball joints. In the mean time (waiting for delivery) I cut and fitted a 6mm threaded stainless rod and new ball joints. That bent within 5 gear shifts. The stock guzzi part is a toughened 6mm part so no simple fixes are possible unless you buy and wait for a stock part (month plus) or get an oversize 8mm part made like I did as a substitute. This has worked very well so far and one key point is that it is made with a standard R/H thread so any ball joints can be substituted. None of the LH/RH issues with the guzzi parts. Good on you mate, I m sure you have the answer to my problem of dodgy down shifts on my California Stone. I will check the spline clamp this week end. Cheers from Larry, Perth, West Australia. Hi Tony, Thanks for sharing your journey with us, that sounded like quite a ride. A habit I do that I’d like to recommend to all riders is to keep an eye on fasteners, especially all of the heel-toe shift linkage fasteners on your California, routinely whenever you wash your bike. )I’m not yet familiar with any similar issues with the California 1400.) The lock washer I mentioned is one that I put on the small bolt that clamps a lever arm to the splined shaft on the transmission that rotates slightly when you move the foot lever. When that loosens, it creates a lot of extra play, so while you feel you are moving the foot lever properly, there ends up being too much play for the little lever arm on the shaft because it is no longer clamped very tightly onto the spline. Of course. I’ve also had the kickstand safety switch nut and bolt loosen and cause the bike to stall when, but that was an easy one, again, keep an eye on that too. I don’t think vibration-induced loosening of fasteners is unique to Guzzi to be fair, but we have to keep an eye on these sorts of things, like a pre-flight check if you will. Home, after travelling some 950 miles, my shift linkage fell off! Luckily, I was in 5th gear and was able to get down the freeway, through a green light off the exit, and make it to my garage without stalling!!!. It appears that the nut, holding the bolt, that attaches to the frame, came loose and fell off unnoticed. With no nut the bolt backed out. 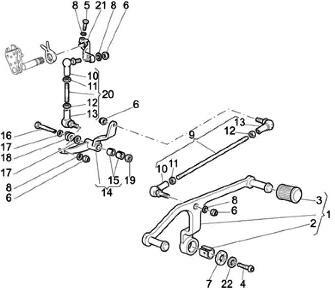 Since I’m going to take the bike into my mechanic to have the bike looked over, is there anything specific I should have the mechanic adjust or address regarding the linkage and shifter? You mention a lock washer and to tighten the adjustment rod if I read that correctly, in order to keep the linkage tight and not miss gears. I too have had trouble finding first, and have had a difficult time finding neutral. Mine fell off on my 2002, I was able to loosen the Allen and get it to shift first then second before it fell off again, so I limped home in second gear. This is how I ended up here, looking for info, now I know what’s up and the best way to access it to tighten it. Simple fix for a mechanically inclined rider! Thank’s John. Yes, your ’03 California Stone is basically the same, you should inspect the linkage as I described, that may be the culprit. If the small lever is not clamped tight onto the transmission shifter shaft, then hitting neutral accidentally is what I experienced. My 2003 California Stone has only 1,689 miles and I hit neutrals between gears on most shifts. Is the solution the same as on your 2007? To make the job much easier on the Left hand side near the linkage there is a frame plate/panel that is held on by two Allen head cap boots. Remove that and with a couple of wobbles, an extension, and ratchet you can tighten them right up with the right Allen head socket tool on the end of the extension! Also a fella named Lee Bruns who makes brass inserts for the shift and brake pedals where they pivot, factory ones were plastic, once you install the brass everything is tightened up and shifts even easier than new. Richard, yes, it sure is frustrating (and risky) when the heel-and-toe shifter linkage loosens and hinders ability to shift positively and/or causes surprise shifts into neutral. Not good from a safety perspective when in busy traffic, so I added this to the list of things I check when I am cleaning or servicing by ’07 CalVin. Like many things, once you become aware of what to look for, it is easy to manage. However, when you don’t know what is causing the problem, or that the problem may occur, then it can be quite alarming. This is what has happened to my CalVin at 20,000 km. It fell off however in the middle of nowhere. It is something that should be brought to their attention and rectified. It is unacceptable to happen to a near new bike. I was missing gears constantly. Have you fixed this? I trailered my bike home today and will start cleaning down and repairs tomorrow. Thanks for these reports. I have a 2010 with only about 2200 miles and it’s nice to get a heads up.